Lord Scarguts Tusk is among the world's most infamous ogres. Gleeful to heedlessly wade into combat alongside his brothers and sisters to make pulp of his foes, he hides his true endgame within his frenzied cunning. Once victory is theirs, the Darkness will need capable and loyal rules for the world! 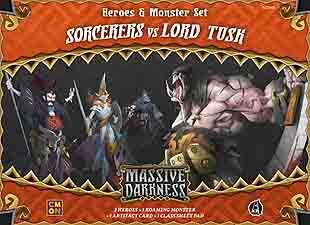 This Heroes & Monster box contains a Roaming Monster, three Heroes, and Artefact, and a new Hero Class for Massive Darkness. Lord Tusk is a juggernaut of a monster, with huge blades that can strike several foes with amazing reach. The Sorcerer Class is a Magic attack specialist, standing in the darkness to blast their enemies. All three Hero miniatures may be used as additional or alternative characters for your game. 3 Hero Miniatures and Hero Cards: Ajax (Sorcerer), Sarah (Noble Warrior), Silence (Bloodmoon Nightrunner) + 1 Lord Tusk Miniature with 2 Cards + 1 Sorcerer Class Sheet Pad + 1 Artefact Card (Sorcerer's Ring).